I was so relieved to go back to my norm of paper piecing and cutting things out that almost this entire card was pieced. The only part I colored was the champagne (more on that a little later). I used *7* different sheets from my new Porcelain paper pad from Basic Grey (LOVE this one - the soft colors and pretty patterns). After I laid out all the pieces, I thought the green pattern behind them made it look like they were sitting next to a window looking out at nature, so I added a piece of acetate behind them to look like a window (the effect is much better IRL). I colored the "liquid" in solid with a yellow Copic, then dotted it with the colorless blender to give it a sort of mottled look. Next, I dotted it with a clear Spica glitter pen to look like itty bitty bubbles, and lastly covered it with dimensional adhesive to look like glass. I really like the way it came out! For the flower, I did the same thing as my last card - cut up 2 Prima hydrangeas and arranged the petals behind a punched circle. All the stitching was done by hand using 2 strands of embroidery floss (I'm totally addicted to hand sewing right now!). 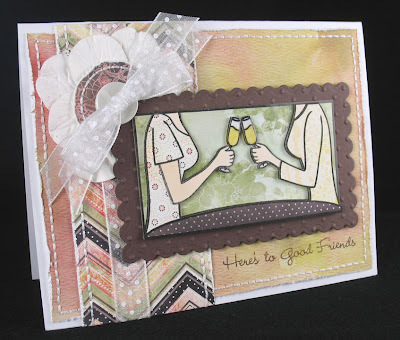 The sentiment is also from the set and was stamped with Papertrey's Dark Chocolate ink. TFL and I hope you like it! 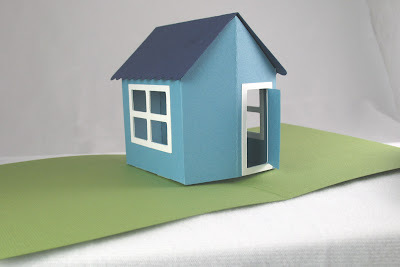 I have a book called Pop-Up Paper Structures by Heidi Pridemore that has a pop-up house project in it that I've been wanting to try for a while, so I created a version for the Cricut, changing the dimensions and scalloping the roof to get a house shape that I liked better. Hope you enjoy it! And do check out Heidi's book - it's got lots of really cool projects! You can get the .cut file here, and PLEASE also download my notes file, which has the instructions on how to actually put the card together. FYI - the file does not include the windows or doors, just the plain house base and roof. If you like it, please leave me a comment and let me know. Also, I'd love to see any projects you make with my file! Last note: I prefer using Plantin for all my files because I love using the endcaps feature to make a lot of my score lines, and some cut lines. Unfortunately, Plantin doesn't have a triangle, and I couldn't figure out an easy way to make one, so I used George just for the triangles. I'm sorry if you don't have both carts, but I've seen both of them for sale so if you really want, you can get the carts, or you can feel free to modify the file as needed. I actually did a few different masking techniques. First, I masked parts of stamps before inking so that I could just stamp parts of the images. On the front of the card, I masked off Flopsey so I could stamp just the tree, and I also masked the kids twice so that I could stamp them 3 at a time. 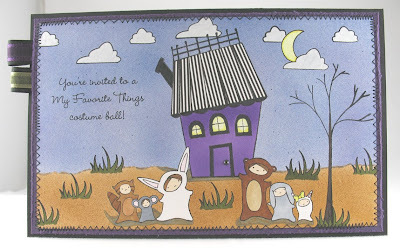 On the inside, I masked off the witches so that the outer line of the stamp wouldn't ink. Second, I masked images so that I could stamp other images over them, and also to airbrush the backgrounds. I did this technique all over the outside and inside to get all the characters layered. And then every single image was masked to do the airbrushing! Lastly I did reverse masking. On the outside, I reverse-masked the house to airbrush it with an even coat of purple. On the inside, I used the reverse mask to stamp the polka dots onto the first Hooga Booga girl, and then I airbrushed inside the mask to color her pink. I did a reverse mask on the bear suit to stamp Isabelle inside. I also used reverse masking to color the blue monster with his speckle texture, and to evenly color both witches. This was an interesting challenge for me since I do a lot of masking for airbrushing, but almost never to layer images. Final notes: I actually did get to do just a bit of paper piecing - the roof of the house. And the sentiment on the outside of the card was computer generated. I hope you all will go and vote at the MFT Forum at Splitcoast [voting starts at 10PM EASTERN time on Tuesday, March 24th and continues through Wednesday, March 25th at 10pm EASTERN. My SCS user name is mm9772] and I really hope that I'll be able to stay in the competition for at least one more round! TFL! All stamps from My Favorite Things. Outside: Monster Squad (trick or treaters and house); Night Night Ellie (moon); Hooga Booga (clouds and grass); Tea with Flopsey (tree). 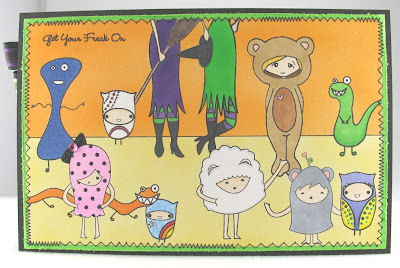 Inside: Totally Witchin' (sentiment and witches); Monsters Ink (3 monsters); Hooga Booga (3 Hooga Booga girls); Behind the Scenes (polka dots on pink Hooga Booga girl); An Owl for All Seasons (3 owls); Isabelle Paper Dolls (Isabelle in the bear suit). Yes! I made it through the first round of voting and am already hard at work on the next challenge - masking. Luckily I got an idea right away, so hopefully I'll be able to play more this week than I did last week. I want to say a HUGE thank you to everyone who voted for me - every vote brought a big smile to my face!! 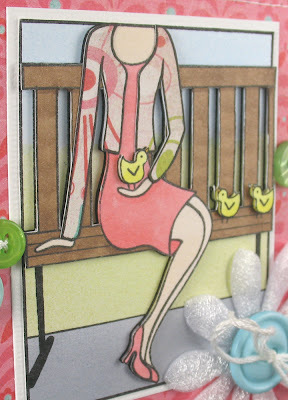 In the meantime, here's a project I did a while back that I'd like to share - my very first project using the Miss Anya Collection from The Greeting Farm. The bag was made using a really old Colluzzle template that I found in my stash. I know I could've used the Cricut, but the template was just there, so I used it! Also, the shape was perfect for the Miss Anya, so I didn't even have to bother measuring and adjusting! Not much to say except the papers are really old 3 Bugs in a Rug, she was colored with Copics and cut out, and I airbrushed the background for a softer look. TFL! 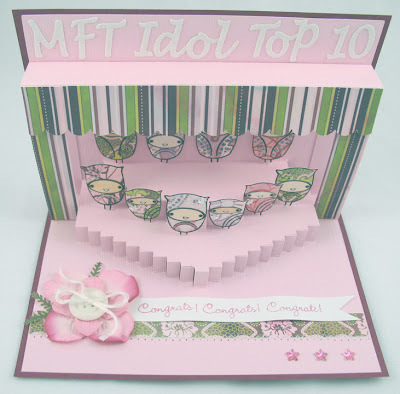 Sorry I haven't posted in so long, but it's because I've been feverishly working on the first MFT Idol challenge!! Yes - I made it into the Top 10!! I'm so excited, but also incredibly stressed out - I have to make the most awesome, fantabulous cards I've ever made in my whole life! This is me celebrating making it into the Top 10. I used An Owl for All Seasons for the owl and the sentiment, and I embellished my little heart out! This is a tribute to everyone who made it into the Top 10! 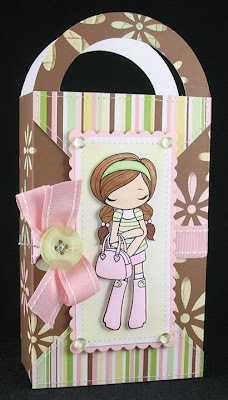 I cut the letters on the top with my Quickutz dies and Doodlebug Sugar Coated cardstock (hope you can see the sparkle). All the owls were paper pieced and their little faces done on white cardstock colored with Copics. Then I fancied them up with Stickles, and some tiny flower rhinestones. And they're all stuck to this double tiered stage that I created myself for the Cricut! I've been doing a lot of Design Studio work using other people's patterns, so I'm really proud that I actually thought this up and created it all by myself!! I learned the basics of designing pop-ups from The Pop-Up Book by Paul Jackson, and then I worked a LOT of hours to create this. The curtained part is a separate piece that I just hand cut and glued around the stage. 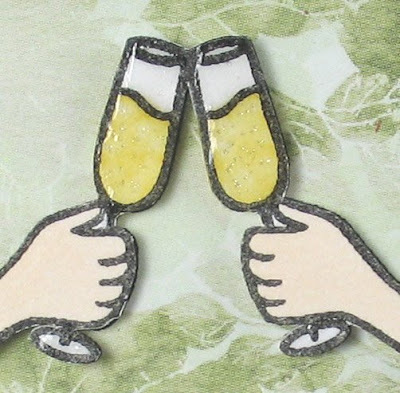 For the sentiment, I used the Congrats from the Digital Girl set, and the exclamation point from Window Shopping. BTW - here's a little tip for masking your clear stamps - I use little pieces of acetate instead of tape - they stick to the clear stamp and you can just wash them off and they're re-usable. 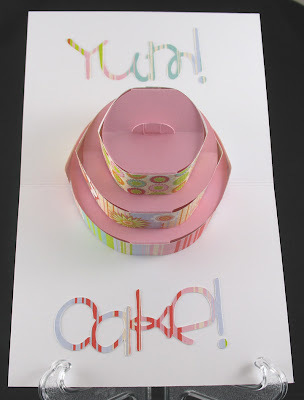 Last note - the card really does fold down - all the pop-up parts really work! I hope you all will go and vote at the MFT Forum at Splitcoast [voting starts at 10PM EASTERN time on Tuesday, March 17th and continues through Wednesday, March 18th at 10pm EASTERN. My SCS user name is mm9772] and I really hope that I'll be able to stay in the competition for at least one more round! TFL! 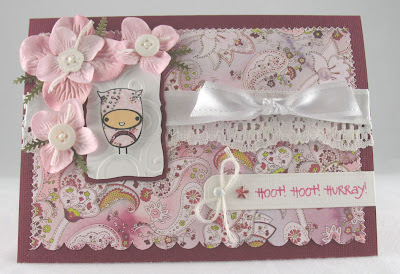 Embellishments: satin ribbon - MFT; small fern punch - CarlaCraft; flower and star rhinestones - Queen & Co.; white brad - Pink Hedgehog Papercrafts; Marisa Mini dies - Quickutz; Labels Trio dies - Spellbinders; Scallop Border Punch - Stampin' Up! ; Stickles Glitter Glue; lace, embroidery floss, and buttons all from my stash. 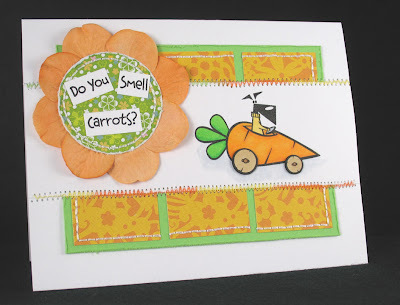 I decided to play in another My Favorite Things challenge and it was to make a Spring card with NO flowers or black (except for the ink). Huh??? I couldn't think of how to do it, I mean Spring normally means flowers, right? Well, I decided soft pastel colors also meant Spring, so I dug through my stash and found this old Lily Kate paper from Basic Grey. I thought it was perfect until I realized almost every pattern has flowers on it! Oh well, I'd already pieced her dress with some of it - too late to turn back now! I used the Isabelle Paper Dolls set and had to include the bunny because my hubby thought it was so cute and told me I had to use it on a card! Not much else to say except those plastic letters are AGES old from my stash (I must remember never to buy giant kits from QVC ever again! 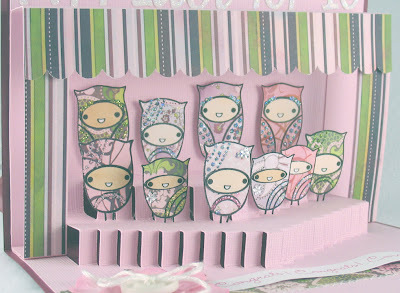 ), but I think they look cute on the card. And I have to say that I think the bunny is pretty adorable too! TFL! I used the set Hangin' with my Peeps and of course I had to do paper piecing and paper tole with the image, so I pieced the sweater and then cut out the bench and woman, popping them up with scrap cardstock because it would have been so much harder to try and fit foam tape on those skinny slats. Then just for kicks, I also popped up the chicks! The background was all airbrushed before I attached the bench/woman. After everything was stuck down, I went back and hand-sewed on the wave of buttons. The patterned paper is all Basic Grey, the cardstock is Bazzill, the flower is from MFT, and the buttons were from my stash. TFL and I hope you like it! 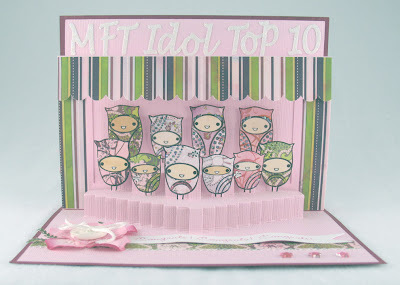 My Favorite Things is having a cool new contest over at their Splitcoast member forum - MFT Idol! All the contestants create an audition project and then the Idol judges (the most wonderful, talented, and beautiful ladies in the world of stamping - you guys are reading this right?? *wink*) narrow the field down to the Top 10. The Top 10 then create their next projects based on the new challenge given, the public votes for their favorite, and the person with the least votes gets eliminated. Then the remaining contestants create a new project for the next week and the public votes again. This continues until the final contestant is crowned MFT Idol and wins a $250 MFT shopping spree!! I wanted to do a card with a clear plastic "window" ever since I saw the Window Shopping set, but I never got around to it until now. 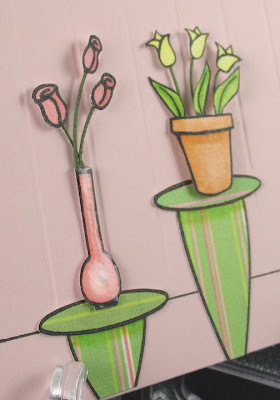 I decided to make a bright flower shop instead of a shoe store in honor of Spring, and because I got these new MFT patterned papers with my last order. I guess I should call it a flower boutique since it's got only the 2 items and they're on those fancy little pedestals, which are the wrought iron display tables from Window Shopping. I paper pieced the tops and bottoms separately to break up the stripe patterns so they would look a little more realistic. The woman is also from the Window Shopping set. You can also see the "beadboard" effect I did by just scoring the walls at half-inch intervals. 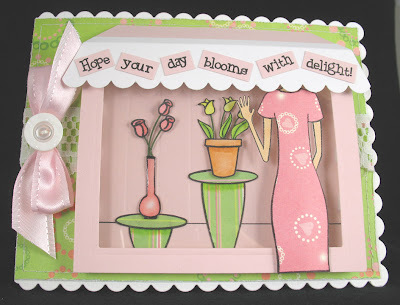 And here's a view from the bottom of the card so you can see all the dimension in the boutique. I used a LOT of foam tape on the window! To make the big scalloped card base (5 7/8" x 4 5/8"), I used my method of enlarging Nestabilities shapes that I wrote about here. The awning was done with the Stampin' Up! scallop border punch. Lastly, I used another print of the patterned paper that I machine stitched, some ribbon from the Royalty Collection, and a button and some lace from my stash. I'm super happy with how the card turned out and I hope you like it too! Thanks for stopping by! I drew 2 names and didn't get any response. It's been so long since I started this, I figured I'll just get it over with already! If you were one of the *original* commenters to the blog candy post here, then leave a comment on this post and the first person wins! So, if your comment shows up first, just go ahead and email me your snail mail and I'll get the stamps out to you ASAP (as long as you qualified before). Thanks! In the March/April 2009 issue of Memory Makers, they showcased 2 different sketches from Becky Fleck of Pagemaps called halfmaps. They are meant to be 6"x12" scrapbook pages, but I thought they would look good as the long skinny cards that fit into the business size envelopes (4"x9"), so I adapted both sketches. When I thought about long skinny images to use, of course Bellas popped into my head immediately! I decided to go with Mwahbella for both cards. <-- This card was made using the first sketch. Of course I had to do some paper piecing on her so I did her shirt and purse. Then I just colored the rest with Copics. I used some rubons for the "mwah", and then I used the mwah sentiment stamp, but I only inked up the (kisses) part of it. I hand stitched the circle with some old DMC Flower Thread that I've had from my cross-stitching days (I just Googled it and found out it's discontinued - maybe I should stop using it and just hoard it! lol!). The flower is from Prima and the button was found in my stash. This second card looks a lot better in real life than here. The silver glitter swirls look very dull and grey, but they're really super shiny and pretty, just like the glitter stickers at the bottom. For the glitter swirl, I stamped a couple of Elegant Flourishes images from Autumn Leaves, and then traced over the lines with a glue pen and sprinkled the glitter on as I went. I didn't use Stickles because I was afraid it would be too gloppy and make all the lines too fat. 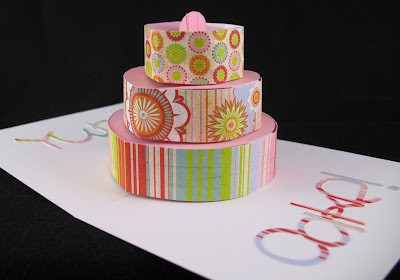 All the patterned paper is from Basic Grey. I really love how both of these cards came out, probably because I really love Becky's sketches. I have to remind myself to go check out Pagemaps more often! I know it's not decorated very nicely, but I was just so excited that I wanted to share right away! Here's the top view. I did the words with the All Mixed Up cartridge and all the patterned paper is from Basic Grey. You can see there's a little tab at the top where you can attach whatever decoration you want - a candle, flowers, tiny bride and groom, etc. I'm having so much fun opening and closing it - I just have to make more! TFL and hope you like my little project! I've removed the .cut file upon request from the creator of the die, so please do not ask me for it. Thanks!